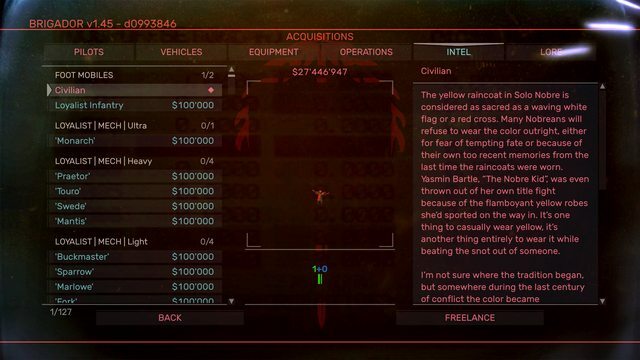 Brigador |RTTP| Your contract's waiting... Do you accept? 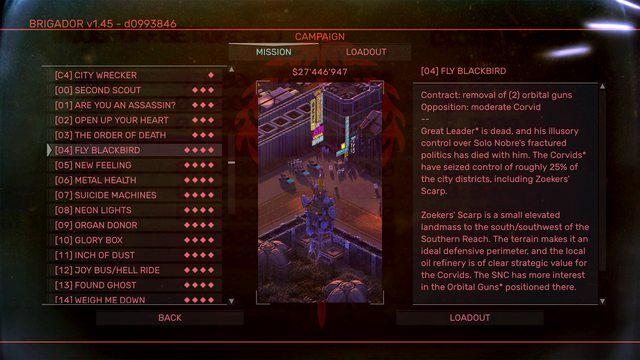 Recently I've come back to Brigador, an isometric mech shooter focused on guerilla tactics and light stealth. I haven't seen as much love as I'd expect given its quality, so here's a big ol' RTTP thread to celebrate its finer points. Set on the fictional planetary colony of Novo Solo in the totalitarian city state of Solo Nobre, the game begins with the death of dictator Great Leader. With the city's governmental structure in chaos, the mysterious off-world Solo Nobre Concern shell corporation begins issuing high-value political espionage contracts to mech pilots across the city. Those that accept betray their world and become Brigadors, tasked with assassination, demolition, and the wreaking of generalized havoc across the city as tools of the shadowy powers that vie for control of the colony. And those civilians in yellow raincoats? Das ist eine statistik. The game's main mode is a lengthy mission-based campaign with multiple character / vehicle choices to tackle each stage with. Alongside that is a roguelite Freelance mode that allows you to pick your pilot, vehicle, weapons, utility item and area route. Unlocks (or 'Acquisitions') for freelance mode are purchased with cash earned across both modes, which gives the game a long tail with the amount of content on offer. The game features 3D gameplay from an isometric perspective, taking place in fully destructible urban environments and encouraging tactical combat reminiscent of MechWarrior. As each mission will be a one-against-many situation, stealth and guerilla tactics are the first order of business. The enemy AI is smart enough to react to the sound of your gunfire, but dumb enough that you can use that as a tactical advantage to lure them into chokepoints or flanking maneuvers. Combined with various explosive structures in the environment, this results in an emergent stealth system that's almost reminiscent of the immersive sim genre. The player can choose to pilot a variety of mechs, tanks and 'agravs' - anti-gravity vehicles. Tanks and mechs operate on tank controls (with optional directional control for accessibility's sake) whereas agravs can strafe in any direction. There are a variety of weight classes available for each vehicle type, ranging from diminutive Mongoose power suits all the way up to the tower block-sized Rat King ultramech. Each vehicle has a primary and secondary weapon, along with a built-in vehicle utility that recharges on a cooldown. This gives the game a huge amount of build variety, and opens up many different playstyles that include full-stealth assassination, glass cannon hit-and-run, and giant-walking-fortress-of-missiles among many others. As a counterpoint to stealth, the game also rewards aggressive play with shield recharge drops from defeated enemies. You can play rushdown, sniper, skirmisher, brawler, all sorts of different ways. It's great, and varied enough that you could spend months playing a different randomized loadout every day and not get the same thing twice. The story is mostly told in the form of Dark Souls-style lore entries tied to pilots, vehicles, weapons, locations and intel items. Much of it is focused around world-building, letting the character arcs of the individual brigadors unfold through gameplay. In addition, the deluxe edition includes an audiobook narrated by the gruff northern guy from the trailer. 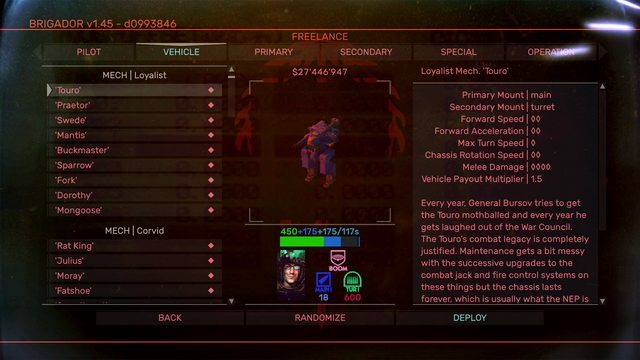 It's enjoyable fare if mechs and military fiction are your bag, and some of the characters from it make an appearance as unlockable pilots in Freelance mode. The graphics are presented in a 2D engine, while offering fully 3D gameplay from an isometric perspective. The game sports a clever rendering pipeline that uses sprites for all game objects, but supports proper dynamic lighting thanks to the pre-rendered assets' inclusion of normal maps. It even has fancy screen-space directional and point light shadowing, which is a rarity for games of this type. All in all it's very stylish, and looks like a slick modern take on the pre-rendered PC games of old. This game is an overlooked gem, extremely polished, and old enough to be decently cheap on Steam and GOG. It's well worth your time if you enjoy action, stealth, vehicle combat, isometric games, or any of the above. Isometric MechWarrior with a synthwave soundtrack? Sold. Sold. Sold. Epic soundtrack, cyberpunk atmosphere and Mechs, why haven't I picked this up yet? Seems to have some focus on stealth gameplay though, or can you just go all in guns blazing? Game looks really neat. Excellent thread as usual @Shifty. That really depends. If you're kitted out with a mech the size of a building and heavy weaponry to match, stealth probably isn't going to be an option thanks to the tall profile and loud report / impact of the weaponry alerting all the enemies. Whereas you're going to have a bad time if you try to play rambo while piloting a mongoose power suit or speedy-but-weak attack motorbike. Death comes swiftly to those with a tiny health / shield pool! There are a few other factors that play in as well, such as lighting conditions affecting visibility for both you and your enemies, how open of a map you're in, and how many enemies are in that map. I'd say it compares to your average shooter- going in guns blazing is easy to start with, and becomes more challenging as you progress. If you're good and equipped with the right gear, you can play that way through the whole game. I think I remember one of the ones you're on about. No ammo, kamikaze enemies everywhere and the only resupply points are at the other end of the level. That was tricky. Awesome game, had it a couple of years. In the past year it also received a huge update. The game isn't under rated though, the problem is that no one knows about it. Was that the Up-Armored Edition, or something else? I've noticed a message on the main menu welcoming Polish brigadors, which I assume is to do with a translation being released. Yes indeed, and hopefully this thread can go some small way toward changing that! Awesome topic! I loved this game even though the controls and perspective never really clicked for me. It never got to be second nature and I had to think about how I wanted to move rather than just where I wanted to move. Even with my difficulties, i played the game for probably 20 hours and think everyone should give it a try. @Shifty. The developers behind it wrote a backdrop to their hard works. I usually pull this up whenever someone claims lazy devs or something. Oh my. This looks good. didn't have the "feel good come back story" that Studio MDHR experienced with "Cuphead" and the game has not sold well for them. Perhaps they can get a port on the Nintendo Switch. I think it'd be an excellent platform for the game! Oh nice, I'll add that to the OP. Quite a story too, the guy in the before-and-after picture looks like he's been to war and back.